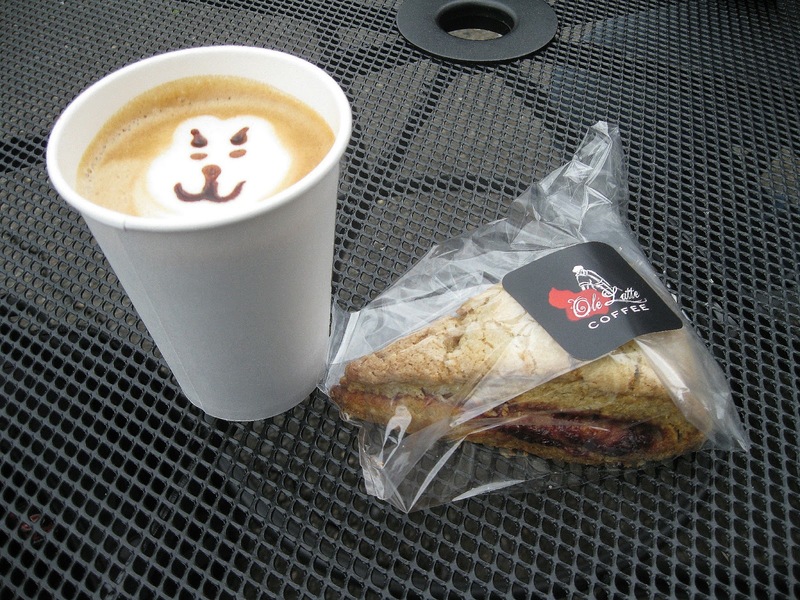 Ole Latte Coffee is a food cart that recently opened at the Green Castle food pod (NE 20th and Everett) in Portland, Oregon. Todd Edwards is the energetic barista and owner working the magic here. Todd takes some time out to wave to the camera! With respect to coffee, Todd uses single-origin coffees from Ristretto Roasters. He usually has Ethiopian, Colombian, and Guatemalan coffees. While the Ethiopian is a lighter roast, the Colombian and Guatemalan coffees delve into the medium-roast side of things. No dark roasts here. There's sugar if you need it, but I love my coffee black! I first tried a medium Colombian drip coffee ($2). I'm not sure why, but this was some of the best coffee I've had. For a light-to-medium roast, it still had a rather full-bodied effect. And the coffee was on the strong side. Pandas love strong, full-bodied coffee. Obviously, the cart has a full espresso bar and is known for lattes. Steve Shomler at Great Portland Food Cart Adventures has a wonderful picture of his latte and scone that he had here on May 23. Man, that drink looked so amazing. I'd feel bad to drink that and mess up the artwork! For me, Todd sold me on a 12 oz. mocha ($3). 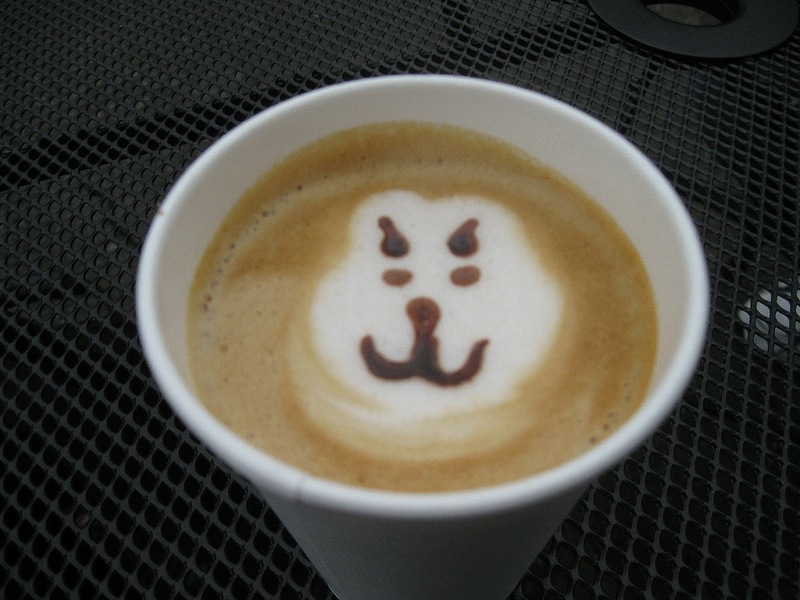 He even did a simple design of what looked like the face of a bear. Or maybe it's a panda. Sure, we'll go with that. Trust me, I'm horrible at stuff like Pictionary. Todd uses this amazing milk chocolate, not adding very much so that you can appreciate both chocolate and coffee flavors. Mocha with vintage facial design! Scones by Stephanie are featured in Todd's bakeshop case, a perfect accompaniment for those hot, caffeinated beverages. He offers free samples if you're on the fence on which scone to get. 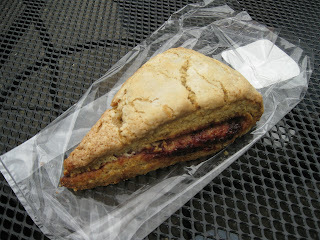 I went with a strawberry barley scone ($3) here. Extremely light and flaky, ideal ratios of ingredients used. The strawberry is noticeable via appearance and taste, but is not the overwhelming star (a good thing here). I'd easily get this one again. Todd is an extremely nice guy, and I wish him well on his food cart endeavor! Be sure to check out his grand opening on June 2 at noon!